The Happy Retreat mansion in Charles Town, W.Va. Formerly the home of Charles Washington, founder of Charles Town and brother to President George Washington. 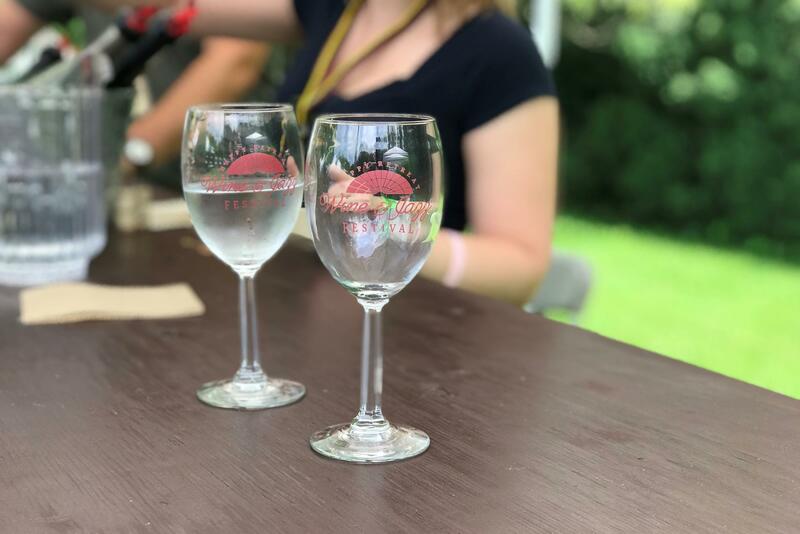 Glasses given to attendees of the Happy Retreat Wine & Jazz Festival on June 9, 2018. A group of musicians play jazz on the back lawn of the Happy Retreat mansion. A dozen smaller tents house both vendors and volunteers during the Wine and Jazz Festival at Happy Retreat. 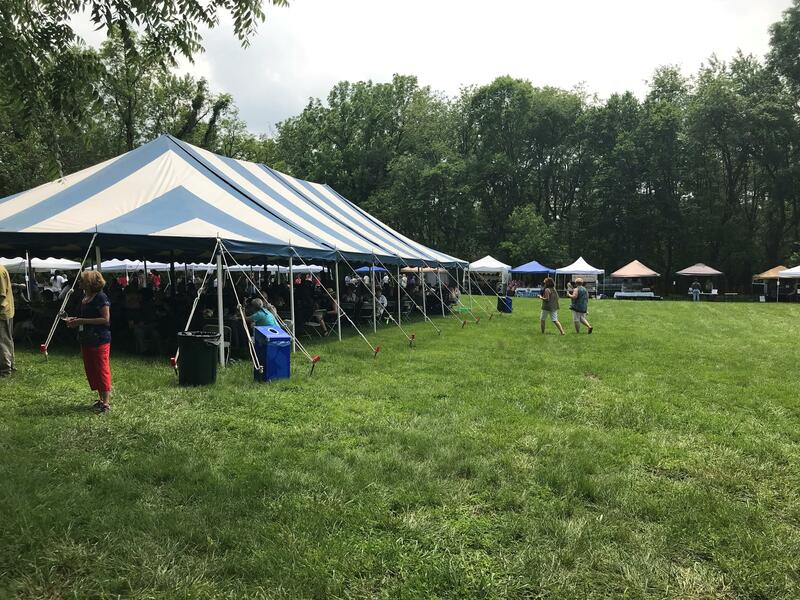 A larger tent offers tables and chairs for festival-attendees. Happy Retreat is a historic mansion in Charles Town that was once the home of Charles Washington – founder of Charles Town and brother to the nation’s first president. Today, the house is becoming a hub for public events, community outreach, history and tourism. 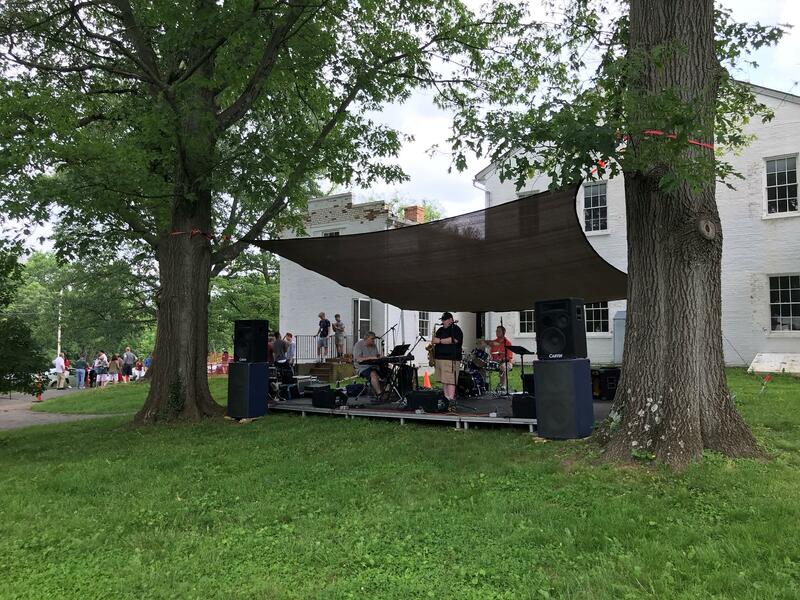 On a hot Saturday afternoon in June, hundreds of locals and out of town tourists stop by a historic mansion in Charles Town, West Virginia known as Happy Retreat. They’re here for a day of wine and jazz out on the back lawn. 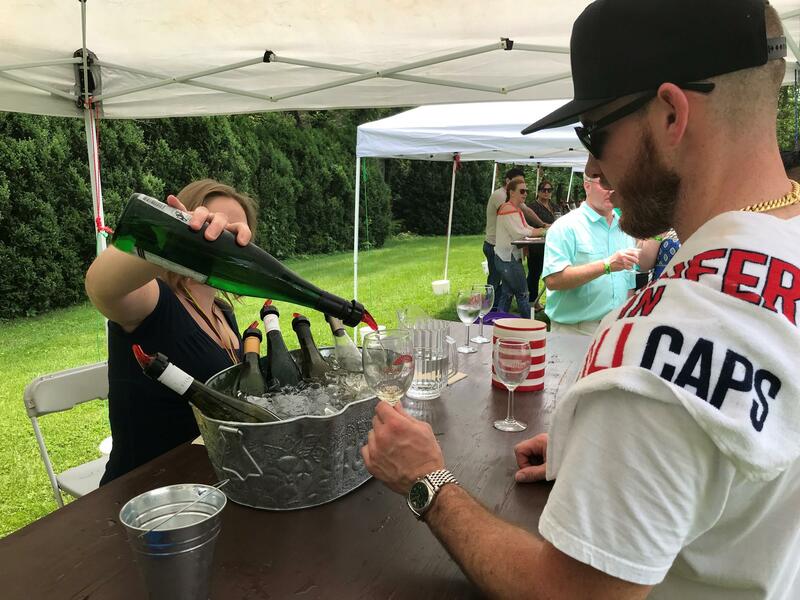 A volunteer serves wine to a man attending the Happy Retreat Wine and Jazz Festival on June 9, 2018. Inside the Happy Retreat mansion, visitors explore the first floor taking in the historic rooms. This house was built in the 1780s by George Washington’s youngest brother, Charles Washington – the founder of Charles Town. It was his home until he died. For more than 200 years, Happy Retreat was a private residence, but then in 2006, the owners at the time were elderly, and the future of the house was unclear. 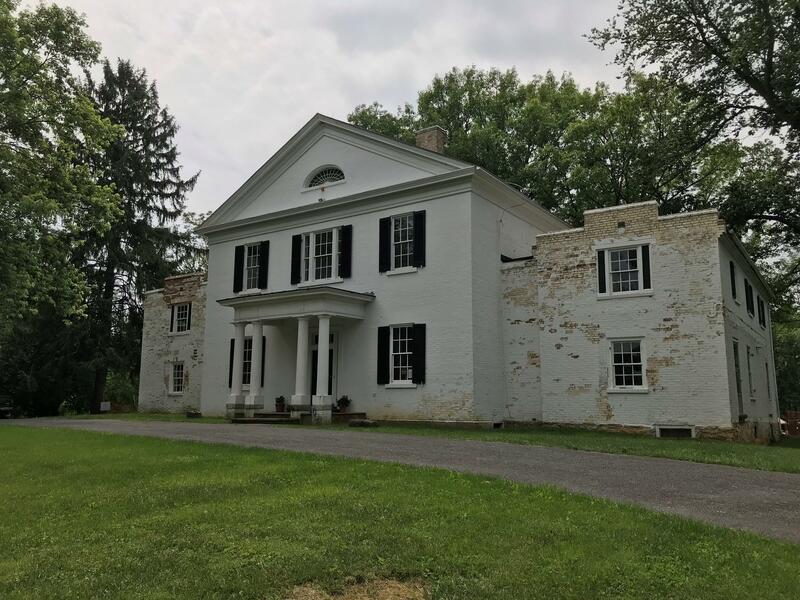 That same year, a group of locals formed a nonprofit group called “Friends of Happy Retreat” to restore and protect the mansion -- and boost tourism for the area, too. Nine years later, the group purchased the home and began holding events on the property. 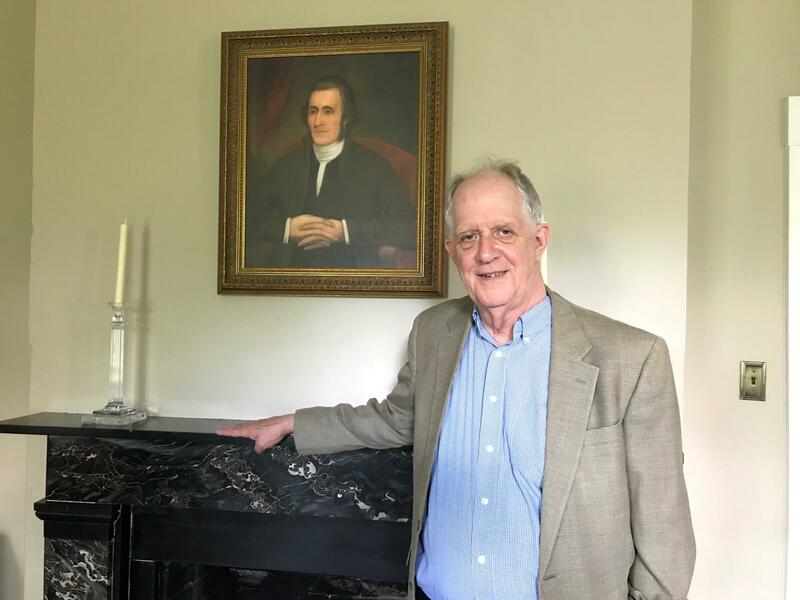 A portrait of Charles Washington, founder of Charles Town, W.Va., hangs on the wall of one of the first floor rooms in the Happy Retreat mansion. 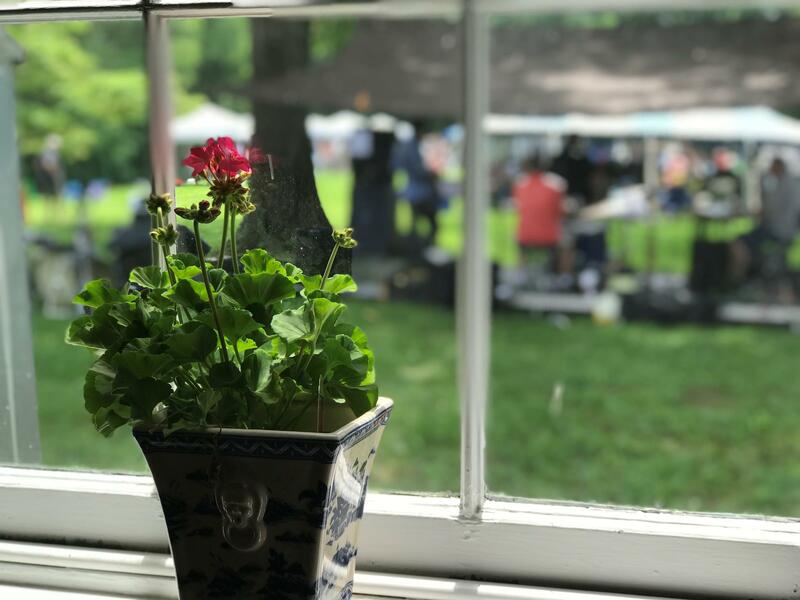 “Friends of Happy Retreat” do charge tickets to attend their events and festivals, but everyone involved in putting those events together are volunteers, and all the proceeds go to further restoring the house. Stephanie Somers was born and raised in Charles Town. She says she’s glad to see the direction the mansion is taking and was excited to come out for the wine and jazz festival. Another festival-attendee, Evan Clark, is a resident from Winchester, Virginia. He crossed state lines just to attend the event. He says bringing people out to the mansion in this way will help keep the history alive. It’s for exactly those reasons, Charles Town resident Walter Washington wanted to turn Happy Retreat into what it is today – a historic landmark that draws visitors through community events. “It was important to have a place in town that could really be; that would draw; a place for heritage tourism,” Washington said. Walter Washington, descendant of George Washington's brother, Samuel Washington. Walter is the President of the nonprofit, "Friends of Happy Retreat." Fun fact about Walter -- he’s actually a direct descendant of George Washington’s other brother, Samuel. Walter’s responsible for starting that nonprofit we mentioned, “Friends of Happy Retreat,” to ensure the mansion’s survival. 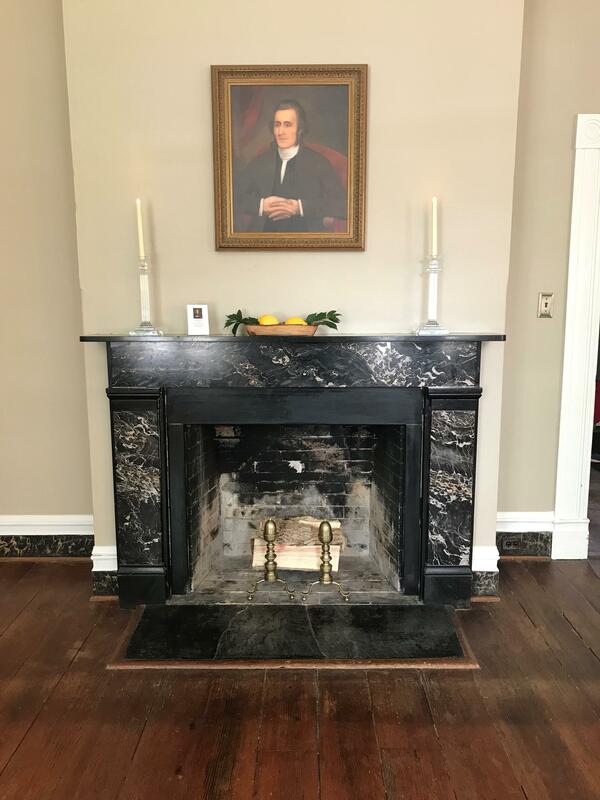 Rather than turn the house into a museum, Walter wanted to bring the place to life by incorporating its history into fun events like wine and jazz, book talks, craft beer festivals, and chamber music concerts. Walter says by making this historic spot a vibrant and exciting place to visit, he hopes it will enrich the community and help increase tourism for the entire state. A potted flower sits in a window of the Happy Retreat mansion. Outside is the back lawn of the house. A temporary stage has been built for the Wine and Jazz Festival on June 9, 2018. There’s something special about putting yourself in a historic space while listening to music or a guest speaker at the same time, that’s according to Director of the Happy Retreat Wine and Jazz Festival Fiona Harrison. In the fall, Happy Retreat will host a Craft Beer and Music Festival.